Brew the tea in boiled water for 5 minutes. Strain and stir in the gelatin slowly. Place into a container and refrigerate until needed. In ½ sphere moulds, place a few diced apple pieces and then fill to the top with the brewed tea. Place in the freezer until needed. In a cocktail shaker place the muddled apple, lemon juice, sugar syrup and the tea and shake well. Place the tea ice cubes in the bottom of a glass and double strain the shaken liquid over the cubes. 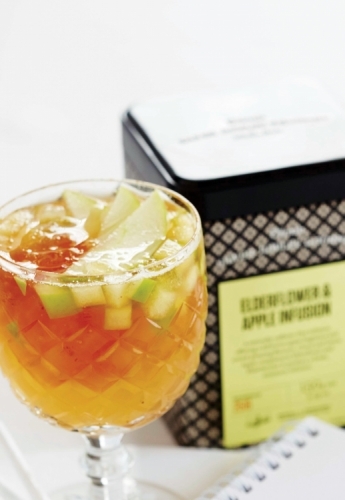 Garnish with apple slices and crumbled jelly and serve.